I read 31 books in 2010, just one more than last year. As usual, the list is a mix of lighthearted fiction and some (slightly) more serious non-fiction. I tend to prefer humorous books of all sorts, and the lovely combination of science, technology, personality and humor made Mary Roach’s Packing for Mars : the curious science of life in the void my favorite book this year. The year started out rather juvenile with a quick read of the popular Twilight series. I was feeding my daughter in a chair in my 12 year old niece’s room, and the only books within reach were Junie B Jones, Kindergartner, or Twilight. I’m not convinced I made the right choice. However, my knowledge of the books has allowed me to engage in some interesting conversations with my niece, which have been fun. My final book of the year was the new ‘biography’ of cancer Emperor of All Maladies by Siddhartha Mukherjee. The book was very engaging and thought provoking. As a book that discusses some history of science, I appreciated the focus on scientific methodologies and the important role personality plays in scientific discovery. As usual, I wish some of my favorite authors could write more – I eagerly await the next books by Christopher Moore, Jasper Fforde and Bill Bryson. Here is the list. Items marked by an asterisk (*) were read on the Kindle app for iPhone. Belmond, C. A. (2010). A rather charming invitation. New York: New American Library. Black, H., & Castellucci, C. (2009). Geektastic: Stories from the nerd herd. New York: Little, Brown and Co.
Bryson, B. (2010). At home: A short history of private life. New York: Doubleday. Collins, G. (2009). When everything changed: The amazing journey of American women from 1960 to the present. New York: Little, Brown and Co.
Fforde, J. (2009). Shades of grey: The road to High Saffron. New York: Viking. Hibbert, C. (2000). Queen Victoria: A personal history. New York: Basic Books. Kessler, D. A. (2009). The end of overeating: Taking control of the insatiable American appetite. Emmaus, Pa: Rodale. Keyes, R. (2009). I love it when you talk retro: Hoochie coochie, double whammy, drop a dime, and the forgotten origins of American speech. New York: St. Martin’s Press. Lamb, C. (2010). Such a pretty face. New York: Kensington Books. Larsen, R. (2009). The selected works of T. S. Spivet. New York: Penguin Press. Meyer, S. (2005). Twilight. New York: Little, Brown and Co.
Moore, C. (2009). Fool. New York: William Morrow. Moore, C. (2010). Bite me: A love story. New York: William Morrow. Mukherjee, S. (2010). The emperor of all maladies: A biography of cancer. New York: Scribner. Rich, S. (2007). Ant farm: And other desperate situations. New York: Random House Trade Paperbacks. Roach, M. (2010). Packing for Mars: The curious science of life in the void. New York: W.W. Norton. Smith, B. (1947). A tree grows in Brooklyn: A novel. New York: Harper. Van, O. K. (2010). Just let me lie down: Necessary terms for the half-insane working mom. New York: Little, Brown. One of the challenges of being a small library is that we cannot collect or keep everything. We don’t have the space to keep things “for historical purposes.” We would like to keep acquiring materials, and this means that we have to find space somewhere. 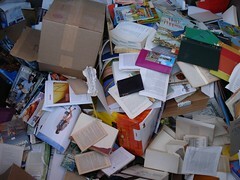 This means weeding materials from our collection (aka, recycling books and journals). Outside factors can make these space pressures more acute – in the summer, our library will be kicked out of one of our on-campus storage locations (the building will eventually be demolished). We will be simply moving some of the materials to another location, but other materials will be withdrawn from the collection to make room. I have been working on several projects to make this possible. First, I have been looking at our print indexes to see what can be withdrawn. Sometimes this is an easy decision: We can withdraw the print versions of Chemical Abstracts and the Bibliography of North American Geology because we have subscriptions to their electronic versions, and those subscriptions won’t be going away any time soon. I know that some librarians will say “but those print indexes are valuable learning and research tools – it’s easier to use the electronic version when you know how to use the print.” To be honest, I’m not sure that I agree with this statement, especially since the electronic tools offer so many more options for finding information. In any case, we simply can’t afford to hang on to them. The next items to go are low use print journal volumes that we have stable electronic access to. This is a bit more complicated, because what does “stable” access mean? Publishers who have made certain journal volumes open access now could always take away that access in the future. What happens when we can no longer subscribe to online access for a journal? These decisions were made on a individual basis. At the same time I am looking at our collection of USGS documents with our government documents librarian. Our collection is a bit odd. Much of it was never entered into our OPAC, so we don’t have a complete sense of what we have. Much of it is now available online, but access is a bit dodgy for students used to clicking on the open url resolver button in GeoRef (which doesn’t work as we’d like for these documents). I’ll be meeting with our geology faculty in the next couple of weeks to develop a plan for these documents – I suspect we will withdraw items that are available online. And finally we have a large collection of books in the storage location that is being closed. These books were moved out of our main library 5 years ago, based on their previous usage. At the time, these books hadn’t been used (checked out or taken off the shelf) in 10 years. Students could still check them out by requesting them from storage. If they were requested they were put back in our main library. So right now, the books in storage haven’t been used in 15 years. Most of them will be withdrawn. I plan to have a quick look through them, however, since they were moved before I arrived here. Of course, one of the trickiest parts of this is communicating this with the faculty. The most visible part of all this is the big recycling dumpster into which all of these volumes are thrown. It isn’t pretty. And you don’t want that dumpster to be the first clue to faculty about what is going on. So I have been trying to communicate with faculty about what we are doing. Sometimes I am asking for advice, sometimes I am simply informing them of our decisions. And I haven’t always done this in the best way possible. For example, I didn’t give the faculty a lot of notice about the Spring Break withdrawal of indexes. At this point the only thing I can do is make a plan to communicate with faculty about the next phases. So I will send emails and request face-to-face meetings with our department representatives over the next couple of months in an effort to be open with the faculty about our decisions. Hopefully they will still see me as an advocate for science resources in the library. The only reason I was able to read as much as I did in 2009 is because of the new eBook readers for my iPhone. In February 2009, I gave birth to my first child, a daughter named Kate, and she kept me busy most of the year. Thanks to the elegantly designed Kindle reader for iPhone, I was able to read one-handed while feeding or rocking my daughter. I also used the new Barnes and Noble eBook reader for iPhone, but that app wasn’t quite as elegant. The pages were just a bit harder to turn, and the need to authenticate using my credit card number was a pain. I will probably give this app another chance in 2010 – hopefully after Barnes and Noble improves it a bit. Last year I read a lot of fiction – a bit easier and faster to read than the non-fiction I like. I found a couple of new authors and rapidly read most of what they wrote. To find these books in a library near you, you can view this list at WorldCat.org. Ackerman, Diane. 1990. A natural history of the senses. New York: Random House. Allen, Sarah Addison. 2008. The sugar queen. New York, N.Y.: Bantam Dell. Allen, Sarah Addison. 2007. Garden spells. New York: Bantam Books. Dorfman, Josh. 2009. The lazy environmentalist on a budget: save money, save time, save the planet. New York: Abrams. Fernyhough, Charles, and Charles Fernyhough. 2009. A thousand days of wonder: a scientist’s chronicle of his daughter’s developing mind. New York: Avery. Florey, Kitty Burns. 2009. Script and scribble: the rise and fall of handwriting. Brooklyn, N.Y.: Melville House Pub. Green, Jane. 2009. Dune road. New York: Viking. Hornby, Nick. 2009. Juliet, naked. New York: Riverhead Books. Kinsella, Sophie. 2008. Remember me? New York, N.Y.: Dial Press. Lamb, Cathy. 2007. Julia’s chocolates. New York: Kensington Books. López, Lorraine. 2008. The gifted Gabaldón sisters. New York: Grand Central Pub. McInerney, Monica. 2006. Family baggage: a novel. New York: Ballantine Books. McInerney, Monica. 2009. Greetings from somewhere else: a novel. New York: Ballantine Books Trade Paperbacks. McInerney, Monica. 2007. The Faraday girls: a novel. New York: Ballantine Books. McInerney, Monica. 2005. The alphabet sisters: a novel. New York: Ballantine Books. McInerney, Monica. 2008. Upside down, inside out: a novel. New York: Ballantine Books. Meacham, Jon. 2008. American lion: Andrew Jackson in the White House. New York: Random House. Morton, Kate. 2008. The house at Riverton: a novel. New York: Atria Books. Morton, Kate. 2009. The forgotten garden: a novel. New York: Atria Books. Murkoff, Heidi Eisenberg. 2008. What to expect the first year. New York: Workman Pub. Myron, Vicki, and Bret Witter. 2008. Dewey: a small-town library cat who touched the world. New York: Grand Central Pub. Nicastro, Nicholas. 2008. Circumference: Eratosthenes and the ancient quest to measure the globe. New York: St. Martin’s Press. Okasha, Samir. 2002. Philosophy of science: a very short introduction. Oxford: Oxford University Press. Shaffer, Mary Ann, and Annie Barrows. 2008. The Guernsey Literary and Potato Peel Pie Society. New York, N.Y.: The Dial Press. Tomalin, Claire. 1997. Jane Austen: a life. New York: Knopf. Walker, Kathryn. 2008. A stopover in Venice: a novel. New York: Alfred A. Knopf. Weir, Alison. 2009. Mistress of the monarchy: the life of Katherine Swynford, Duchess of Lancaster. New York: Ballantine Books. Weisberger, Lauren. 2008. Chasing Harry Winston. New York: Simon & Schuster.